The Common Ptarmigan of Britain, Lagopus mutus of LEACH, which is said to occur on the continent of Europe, although less abundant there and confounded with the Rock Grouse, Lagopus rupestris, has been, it was thought, found by Captain SABINE on the islands lying on the south-west side of Baffin's Bay, and this species was published in my Ornithological Biography as identical with that bird. Individuals of a species of Ptarmigan obtained in Baffin's Bay have been considered as specifically identical with the Scottish Ptarmigan. 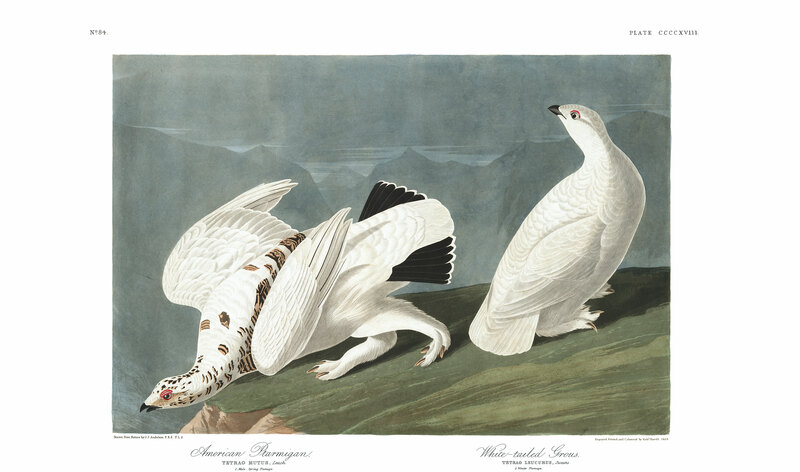 In the Fauna Boreali-Americana, Dr. RICHARDSON remarks, that "a specimen, in summer plumage, sent to Sir JOHN FRANKLIN from Churchhill river, was identified by JOSEPH SABINE, Esq., with the Scotch Ptarmigan,--thus establishing it as an inhabitant of the American continent." "I have not been able to trace that specimen," he continues, "and I am informed, that the only authentic examples from the New World are now in the possession of Lord STANLEY, now Earl DURBY, to whom they were presented by Mr. SABINE." The distinguished nobleman here mentioned, my generous friend the Earl of DERBY, having, with his usual liberality, lent me three fine specimens, I have represented that which seemed to me the most beautiful. At the same time, after due consideration, I am satisfied that the bird figured by me, is not the Common Ptarmigan, although it presents all the characters of the Rock Grouse or Ptarmigan. It is less than the Scotch Ptarmigan, and its wings are much shorter, and even more concave; and in these respects it corresponded with the other two specimens, which however had the plumage pure white, with the exception of the tail-feathers and the shafts of the primaries. I have therefore named this bird, as a species distinct from either, Lagopus Americanus. I have seen three specimens in the Museum of the Andersonian Institution of Glasgow, which were purchased from Captain SABINE, and which I think may be referred to this Ptarmigan, or at all events are different from the Rock Grouse. In the present state of our knowledge as to the changes and variations of plumage in Ptarmigans, it is impossible to form a decided opinion in many instances; nor will the subject be free of doubt until each alleged species has been traced through all its gradations. TETRAO LAGOPUS, Sabine, Richardson, &c.
TETRAO (LAGOPUS) MUTUS, Ptarmigan, Swains. and Rich. F. Bor. Amer.,vol. ii. p. 350. COMMON PTARMIGAN, Tetrao mutus, Aud. Orn. Biog., vol. v. p. 196. Male, 14 3/4, wing, 8 1/4. The following is the description of the individual represented in the plate. Bill short, robust; upper mandible with its dorsal outline curved, the ridge and sides convex, the edges overlapping, the tip declinate, thin edged, rounded; lower mandible with the angle short and wide, the dorsal line convex, the back broadly convex, the sides rounded, the edges inflected, the tip blunt. Nostrils basal, roundish, concealed by the feathers. Head small, ovate; neck of moderate length; body full. Feet of ordinary length, robust; tarsus feathered, as are the toes; the first toe very small, the middle toe much longer than the lateral, which are nearly equal, the inner being a little longer. Claws slightly arched, depressed, broad, thin-edged, rounded at the end. Plumage compact, the feathers ovate and rounded; those on the tarsi, toes, and soles, oblong, with loose stiffish barbs. Wings rather short, concave; the primaries strong, narrow, tapering, pointed; the first an inch and ten-twelfths shorter than the second, which is four-twelfths shorter than the third, the latter being the longest. Tail rather short, nearly even, of sixteen broad feathers, of which the two middle are less strong, but longer than the rest by a quarter of an inch. Bill black; superciliary membrane scarlet; claws greyish-yellow, dusky toward the base. The plumage is pure white; but on the head, sides of the neck, and back, are several new feathers which are broadly barred with orange-yellow and dark brown. The feathers in the loral space are black only at the base. The shafts of the six outer quills are brownish-black, and all the tail-feathers, the two middle excepted, are greyish-black, with a terminal narrow band of white. Length to end of tail 14 inches; bill along the ridge 5/12, along the edge of lower mandible 8/12; wing from flexure 8; tail 4 1/2; tarsus 1 2/12; middle toe 1, its claw 9/12. The bill seems to be narrower than it generally is in the Rock Grouse, but the description and dimensions of this bird are scarcely different from those of an individual of that species in the same state of plumage. A specimen in the Museum of the Andersonian Institution, marked "Lagopus vulgaris, Ptarmigan, Melville's Island," is a male in winter plumage. The bill is brownish-black, as are the claws. A black band extends from the bill to the eye and behind it. The general colour of the plumage is pure white, as are the two middle tail-feathers, the rest greyish-black, narrowly tipped with white. The third quill is longest, two-twelfths longer than the second, which exceeds the first by an inch and five-eighths. Length to end of tail 14 1/2 inches; bill along the ridge (7 1/2)/12; wing from carpus 8 2/12; tail 5; tarsus 1 (1 1/2)/12; middle toe and claw 1 1/12. Another specimen marked "Lagopus vulgaris, Ptarmigan, Melville's Island," is in summer plumage. The general colour of the upper parts, fore neck, and sides, is reddish-yellow, finely undulated transversely with blackish-brown and greyish-white; the bars on the head and neck larger. The middle tail-feathers are similar to those of the back; the rest brownish-black, tipped with white. There is little white on the lower parts, and that only in patches. The greyish-white undulations in this individual tend to approximate its colouring to that of some specimens of the Scottish Ptarmigan, but still the prevailing tint is not grey, but brownish-yellow. Bill (7 1/2)/12 of an inch long; wing from flexure 8; tail 5; tarsus 1 (1 1/2)12. A specimen marked "Ptarmigan, Melville Island, Aug. 15, 1820," is a young bird, marked like the old, but with the bands larger. The fore part of the wings, the primaries, the secondary coverts, and the abdomen, are white.